Passed B.Sc Degree in PCM Discipline or 3 Year Full Time Diploma in Chemical Engineering with minimum 50% Marks for GEN/OBC Applicants and 45% Marks for SC/ST/PWD. Eligible Candidates can Submit Online Application at the Official Website of NFL Latest by 14th March 2019. Applicants First Open NFL Official Website. 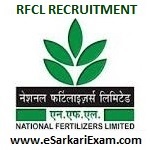 Open Careers Link and Click on Recruitment in RFCL Link. Open Recruitment of Non Executives Production Link.